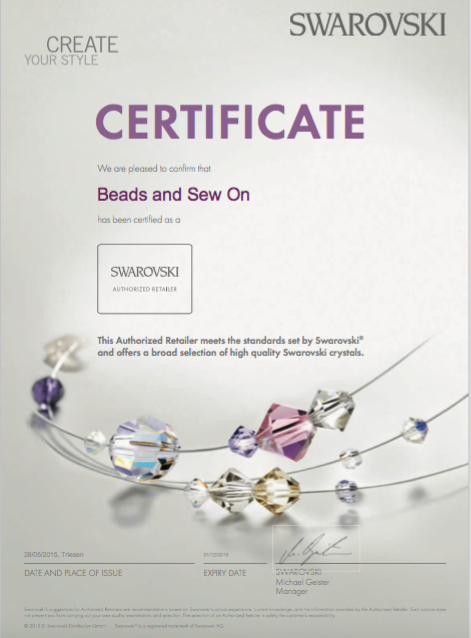 Welcome to Beads and Sew On, Ireland’s only certified distributor of SWAROVSKI CRYSTALS. Beads and Sew On is an Irish owned, Dublin based, online company with over 20 years experience in the Hand Craft Industry. We stock a wonderful range of Swarovski Sew On Stones, Hot Fix and No Hot Fix Rhinestones AND Swarovski Beads and Pearls. If there is any product that you need, which isn’t on our site, please just contact us and we’ll do our best to get it for you. We stock an ever growing choice of Beads from around the globe. Offering Findings, Threading Materials, Ribbons, beautiful Lace & Trims, Tools and Jewellery Making equipment. We will soon be offering a wide range of Jewellery Making classes and workshops – both live and online. Our aim to provide Quality and Economy hand craft materials includes a huge variety of big value glass Faux Pearls. You’ll find our prices very competitive with a fast, friendly and efficient service. Orders received within Ireland, before 12:00, will be posted same day for Next Day delivery. Beads and Sew On values your custom and support. We look forward to helping you with all your crafty needs.